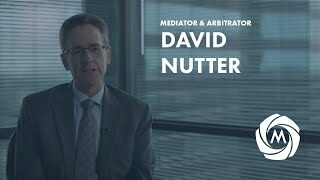 David C. Nutter is one of the most sought-after mediators and arbitrators in Georgia. As a Senior Neutral at Miles Mediation, he has mediated over 1,600 cases involving commercial disputes, employment litigation, restrictive covenants, contracts and torts, corporate and partnership litigation and dissolutions, real estate, technology implementations, trust and estates, insurance coverage, construction, securities, banking and finance, nuisance claims, false arrest and excessive force cases, and significant personal injury suits. David has extensive trial experience, including seven years as an award-winning Assistant United States Attorney in Atlanta, where he prosecuted fraud and public corruption cases. In 1996, he received the Department of Justice’s Director’s Award for Superior Service as an Assistant United States Attorney. He also received the Federal Bar Association’s National Younger Federal Lawyer Award for outstanding service to the U.S. Government (1995). In 1986-87, following law school, David clerked for the Honorable Patrick E. Higginbotham, U.S. Court of Appeals, Fifth Circuit. David is a Founding Member of the Georgia Academy of Mediators and is a member of the National Academy of Distinguished Neutrals.